Native to North America, blueberries grow in acidic soils of pH 5.5 or lower. In southern Minnesota, where pH levels tend to be closer to 6.0-7.0, soil amendments of peat and sulfur are highly beneficial to lower pH. Because they have relatively few pest problems, blueberries lend themselves quite well to organic production, given regular weeding and watering. We are beginning to see Japanese beetles in our blueberries because of climate changes. Our harvest season starts in late June and ends in August. The foliage provides beautiful fall displays of deep reds, making blueberries as ornamental as they are delicious! 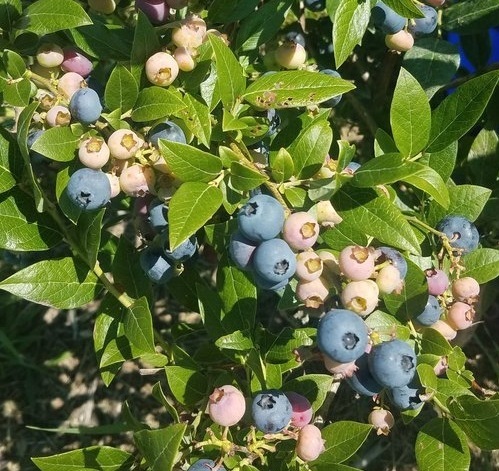 At Blue Fruit Farm, we grow a lot of varieties of blueberries including Polaris, Northland, Northblue, Bluecrop, Bluegold, Patriot, Superior, Nelson, Elliot, Elizabeth and 1 Reka. This wide range of varieties helps promote adequate pollination, extend the harvest season, and increase the size of our berries. Our initial plantings were sourced from St. Lawrence Nursery located in upstate New York, Hartmann's in Missouri for the Elizabeth variety, and Blue Grass Nursery in Kentucky for the Elliot plants. We added Blue Ray blueberries in the spring of 2014 sourced from MOSA certified Backyard Berries of Indiana. We also source replacement stock from Woodstock Nursery. Blueberries are one of the highest ranking foods on the brain food list! Blueberries contain anthocyanin making it a super-antioxidant food. A long-term study done at Harvard on 16,000 women showed that those who ate one or more half cups of blueberries a week stayed sharper than women who did not eat the berries. The study also showed that those who ate blueberries could delay cognitive aging by two and a half years simply by eating this super fruit. Blueberries are also a wonderful and very tasty source of Vitamin C and K, Magnesium and a great source of natural fiber! Citation: Shreeves, Robin (2018). Mother Nature Network: 5 nootropic foods to boost brain function. Sweet and juicy, fresh blueberries taste wonderful when ripe. Fresh berries can be used in salads, cereal, oatmeal, smoothies, drinks, atop ice cream or other desserts, or eaten by the handful! Berries can be made into jams, juices, and glazes. And of course, they also make for fantastic pies, crisps, muffins, scones, breads, and pancakes. 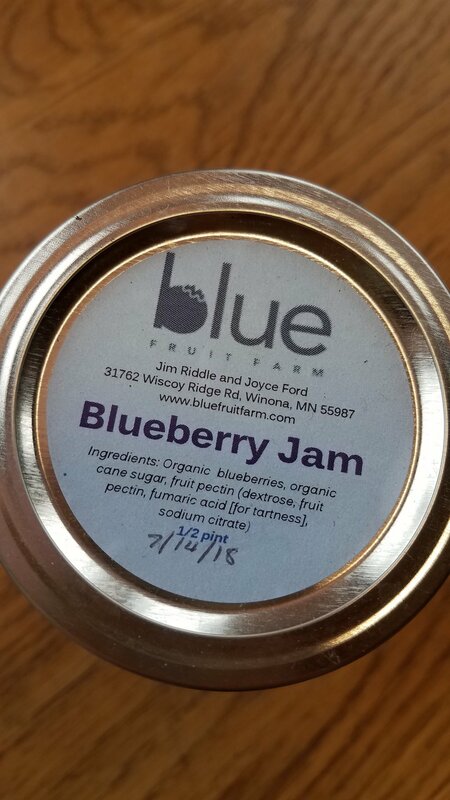 Jams we make using our blueberries are Blueberry, Blue Currant, Aronia Blue, and Blue Fruit Medley. We sell fresh and frozen 5 lb bulk blueberries.